It’s a good time to be a New Yorker if you’re a fan of movie theaters. New multiplexes have been opening left and right, particularly new dine-in locations. In the past three years, New York has gone from one dine-in cinema (Nitehawk in Williamsburg) to five (iPic, Alamo, CMX and a second Nitehawk). The Dine-In invasion isn’t stopping. In 2019, seven brand-new multiplexes are set to open within the five boroughs. Four of them are dine-ins. However, they’re not just some obscure hipster locations. One of the new locations is an AMC with IMAX and another a Regal with RPX. Besides, it’s not just dine-in theaters opening but also other movie houses such as one by the makers of 4DX. Here’s a detailed look at the seven new movie theaters scheduled to open within Manhattan, Queens and Staten Island in 2019. Please note that all the completion dates are estimates which are prone to being broken. Where? Lower East Side. (115 Delancey Street). What features? 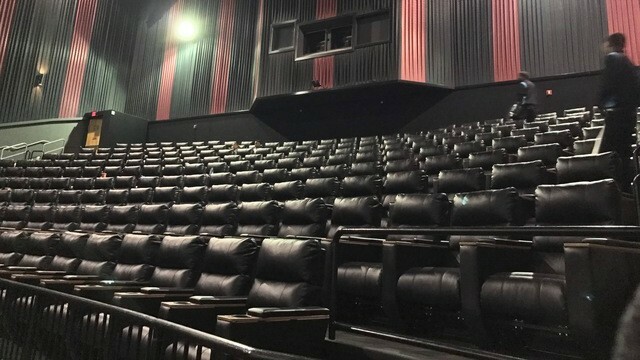 Dine-in, recliners, stadium seating and a RPX auditorium. Who could have thought that a Regal multiplex would one day be serving meals and alcohol? Indeed, this brand-new 14-screen establishment in Manhattan’s Lower East Side will include a kitchen. It’s not a traditional dine-in however, as servers won’t be running within auditoriums but customers will have to carry drinks and plates to their seats themselves. At least those servers won’t need to break their backs trying not to obstruct people’s views. 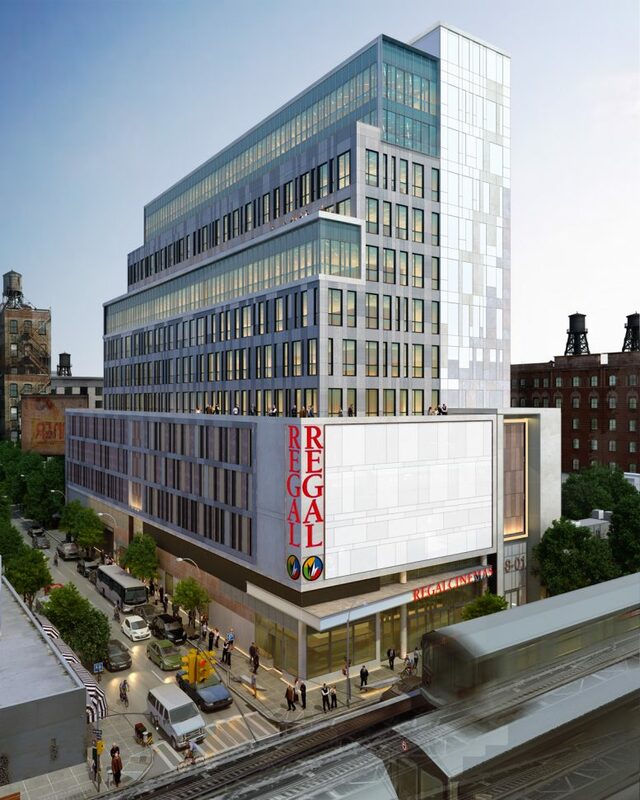 It will all be on Site 2 of Essex Crossing, a massive development stretching over multiple blocks filled with residential and commercial space. This is set to be the Lower East Side’s first first-run multiplex, as Metrograph has so far been its sole cinema after Landmark’s Sunshine shut down last January due to an expiring lease. Regal itself only has three locations in Manhattan: one in Battery Park, one in Times Square and one in Union Square. Aside of the fancy drinks and meals, Essex 14 will also offer Regal’s premium format RPX and recliner seats. Where? Financial District (28 Liberty Street). When? Third quarter of 2019. What features? Dine-In, film & laser capabilities and a bar concept called “Video Vortex”. If you work on Wall Street, you already have a variety of movie theater choices. There is the luxury dine-in iPic on Fulton Street or the Regal in Battery Park. Prepare to get a third option: Alamo Drafthouse. Alamo previously opened not too far away in Downtown Brooklyn and is also working on a Staten Island location. Now the Texas-based dine-in chain will bring its ‘text and die’ policy to the Financial District. It’ll be in the basement of 28 Liberty (also known as One Chase Manhattan Plaza) where Alamo plans to feature 12 screens, some with laser and film projectors. That would make it larger auditorium-wise than both the Regal (11 auditoriums) and iPic (8 auditoriums) nearby. Don’t expect them to play all the same blockbusters though. Theater clearances will have their way and Alamo already hopes to give independent films their chance to shine with this location. What features? Recliners and underground parking. Queens has many great theaters, but who says that New York’s second most populated and geographically largest borough can’t use another one? Regal currently runs three theaters in the borough. (One in Astoria, one in Forest Hills and one in Glendale.) Sunnyside however has lost a theater four years ago and it just happens to be that a large new development is happening there. So Regal jumped on it and became the anchor tenant of “The Sunnyside”. The new theater is set to be located over two floors, have eight auditoriums and include 440 brand new recliner seats. The location isn’t just easily accessible if you live in Queens, but is also just a few subway stops away from Manhattan. Plus, why wouldn’t Amazon workers like movies? Additionally, suburban moviegoers from Queens, Brooklyn and Long Island can enjoy the over 100 underground parking spots “The Sunnyside” is set to provide. While Regal’s Astoria location is less than a mile away, it is also extremely popular and unlikely to receive recliner seats. Thus, Regal’s new Sunnyside location will ease the congestion there, replace a previously closed theater and provide a fresh, new multiplex for the increasingly popular area. Where? Flushing (133-15 39th Avenue). When? Fourth Quarter of 2019. What features? 4DX, ScreenX, Korean films & subtitles. You know that Korean company behind 4DX and ScreenX, those premium formats with moving seats and wall-projectors? They’ve expanded in the U.S. by making a deal with Regal, but actually operate quite a few theaters themselves in Korea. CJ Group is the organization behind those innovative technologies and they’re planning to bring their third American cinema franchise dubbed “CGV” to Flushing. The first two are located in Los Angeles and contain 4DX and ScreenX auditoriums, both of which have so far only been available to New Yorkers in Manhattan. Additionally, CGV theaters tend to play some Hollywood blockbusters with Korean subtitles while also providing Korean films with English subtitles. Flushing itself is home to a Korean community, which is likely the reason CGV chose it. However, it’s unlikely to be the only reason as Flushing’s CGV will be located in a large new hotel-office-retail development called “The Tangram” whose developers described as a smaller version of the Time Warner building near Columbus Circle. So if you enjoy 4DX, ScreenX, Korean films or Korean subtitles you’re in for a treat. Besides, Flushing doesn’t have a single movie theater. With CGV, it’s getting something quite special and exciting. UPDATE April 2019: Regal Cinemas will now become the movie theater in Flushing instead of CGV. 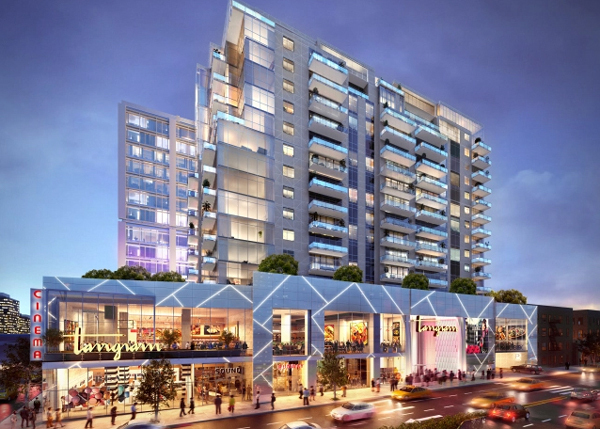 Apparently, the developers felt more comfortable with Regal becoming the multiplex at the Tangram. CJ Group, the company behind CGV, does have a deal with Regal, so 4DX will still make it to Flushing. Where? South Shore (165 Bricktown Way). What features? Recliners, parking, RPX and a café. Regal is already expanding in Manhattan and Queens this year, but who could possibly forget about Staten Island? Well, not too many actually. This is one of three new multiplexes opening in New York’s southernmost borough. However, theater developers do appear to have forgotten about the South Shore of Staten Island. Yes, it’s more conservative and suburban than the rest. That doesn’t however mean that its residents don’t enjoy a night out at the movies. Regal currently operates a multiplex on Staten Island’s North Shore and had to close one in New Drop Beach a few years ago. Now that a new retail complex is being built in Charleston, Regal is making up for that last location with a 10-screen multiplex. In addition to a RPX auditorium, the theater is also supposed to feature a cafe and recliner seats. Originally it was set to open around the summer of 2018, but that got delayed potentially due to a fire which happened at the construction in late 2017. However, the theater seems to be quite ready now as it put out ads seeking employees in late 2018 and is already listed on the ticketing website Fandango. Where? Heartland Village (2655 Richmond Avenue). What features? Dine-in, recliners and IMAX. 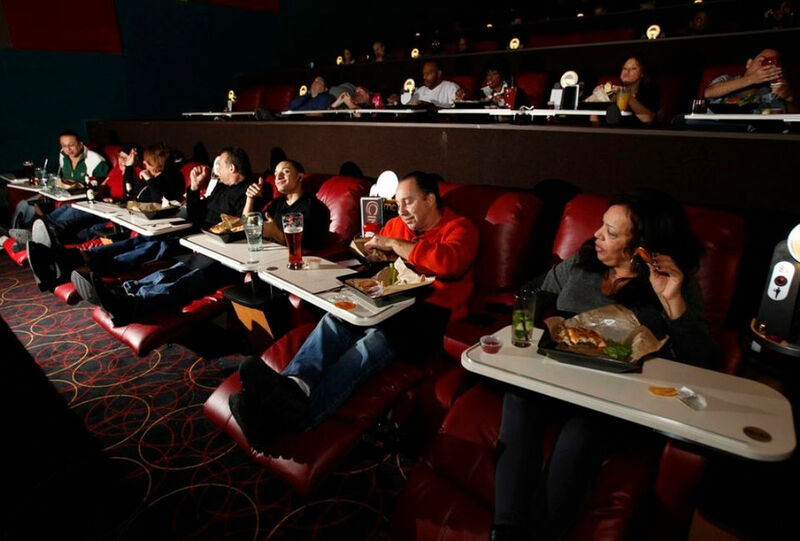 AMC is making its debut on Staten Island with a full package: Dine-In service, recliners and an IMAX. Yes, you’ve heard that right. An IMAX auditorium in a dine-in complex. 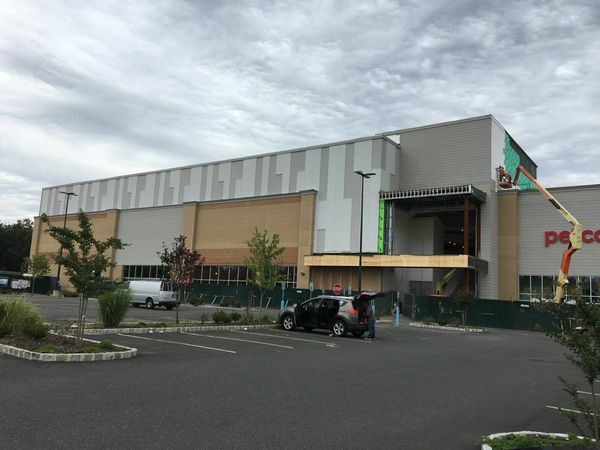 The 11-screen theater is part of a new fully renovated Staten Island Mall. Although it’ll have to compete for Dine-In customers with Alamo Drafthouse, this new AMC location will be the first and only IMAX on Staten Island. In addition, there aren’t too many theaters Mid-Island in the first place. The theater is already listing on various ticketing platforms and we expect it to open within a few months. Other parts of the newly renovated Mall are already open. What features? Dine-In, recliners and a “Wu-Tang Clan” themed bar. Remember that Regal theater that had to be closed for a new mall we talked about earlier? Well, that mall is called “The Boulevard” and Alamo Drafthouse will soon be showing movies there. Staten Island will thus be going from zero dine-in complexes to two. Additionally, Alamo being Alamo, the theater will feature a special bar. “The Flying Guillotine” is kung-fu themed and built by one of Wu-Tang Clan’s disciple. That way all three Alamo Drafthouses in New York City will house a specially-themed bar. The theater is reported to feature 10 screens and over 900 recliners. So, that was it. Those are the seven new multiplexes set to open in 2019. Which one are you most excited about? Let us know below.